Yvonne Scarrott has been a successful and popular name on the local running scene for many years, numbering the British Masters 10k title and Cambridgeshire Road League among her numerous awards. But the Nene Valley Harrier felt that she had never done herself justice over her favoured distance, the marathon. However, she put that right on Sunday with an outstanding run at Manchester, where she smashed her PB with a 3:12.02 clocking, a time that was good enough to see her take second place in the Over 45 category and put her second in the 2016 national rankings. Scarrott was joined on the start line by a healthy contingent of runners from the Peterborough area, many of whom impressed on the fast and flat course. Danny Snipe was another runner to make nonsense of his previous marathon best. 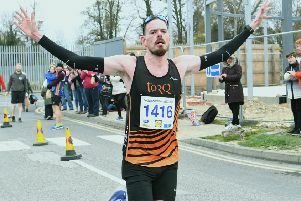 The Peterborough AC member had failed to get under three hours in his previous two outings but set the record straight, finishing 68th in an excellent 2:46.29. Stephen Lomax of Yaxley was another local to impress with a fine run of 2:55.03. Nene Valley Harriers 18 year-old Jevan Robertson clocked 3:02.03 on his marathon debut - an impressive time which guarantees the March-based youngster entry to the London Marathon for the next two years through the good for age system of qualification. The event also included a marathon relay, which the Bushfield/Peterborough AC duo of Phil Martin and James Sadlier completed in second place. The pair ran a half-marathon each, with a combined time of 2:45.03. Other local times: James Macdonald (Nene Valley) 3:02.21; Michael Stacey (March) 3:08.26; Lee Whitton (Eye) 3:12.41; Ray Wilson (PAC) 3:14.00; Andy Todd (Yaxley) 3:14.06; Sarah Caskey (PAC) 3:17.44; Andrew Johnson (Yaxley) 3:43.01; Kerry Balmer (Yaxley) 3:45.09; Chris Hopewell (Bushfield) 3:46.44; Anna Totterdell (Yaxley) 3:51.08; Wendy Coxshall (Bushfield) 3:55.44; Mick Davies (Eye) 3:56.44; Louise Hooper (Bushfield) 4:01.51; Deborah Nolan (Eye) 4:05.14. Werrington Joggers used the Sandy 10 as part of their club Championship on Sunday. Jeff Lucas was first home for the Joggers, finishing 10th in 1:01.03. Anne Wood was the first Werrington lady home, finishing fourth in an impressive 1:12.31. Nene Valley’s off-road specialist Ruth Jones has another victory under her belt after finishing as first lady in the Caythorpe Canter - a half marathon held in the Lincolnshire countryside. Mick Davies of Eye Community Runners secured the Harrier League title at Lynch Wood on Wednesday evening. Davies was a worthy winner staying one step ahead of the handicapper by making steady improvements throughout the six race series. Bushfield’s Alison Shepperson was runner-up with Charlie Brooks of PACTRAC third. Former Nene Valley star Michael Balls was first over the line on the night in a time of 19:39 followed by Carl Francis and Charlotte Edwards, both of Bushfield. Eye’s Ben Heron set the quickest time, completing the three-lap course in 16:26. Jordan Foster (unattached) was the fastest lady in 20:03. Heron’s run earned him the prize for fastest man of the series, while Stamford Strider Maggie Skinner took the ladies prize thanks to her time of 18:59 set in the March race. Nene Valley veteran Dave Neal won the age graded prize with a run of 17:38.